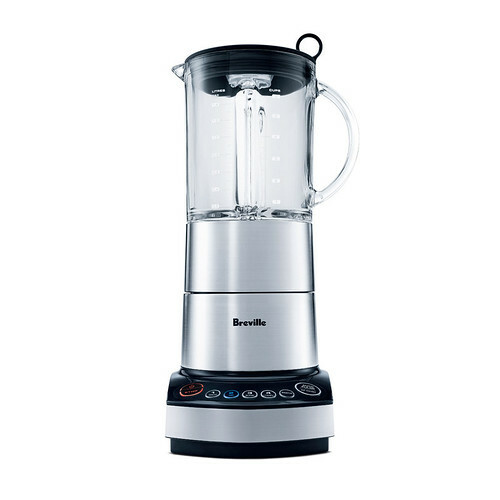 The Breville ikon Hemisphere® Blender — Innovative Hemisphere® Bowl/Blade technology delivers an efficient blending system that handles a wide variety of kitchen tasks. The heavy-duty glass jar resists chipping, cracking, and fogging. The stainless steel base adds a stylish, elegant touch to any kitchen. A. Inner Measuring Lid - for adding ingredients while blending. B. 51oz. (l.5L) Glass Jar - unique dual ribs continually pass ingredients onto the blades for perfectly blended results. C. Heavy duty, commercial grade components for durability. D. Stylish stainless steel design - for lasting professional performance. E. Illuminated buttons - for clarity, making reading easier. F. Electronic speed controls - plus Auto Pulse and Smoothie functions. I. Hemisphere® blade system - ensuring that there are no 'still' spots around the blades. J. Blade removal - the blades are easily removed for fast and easy cleaning. 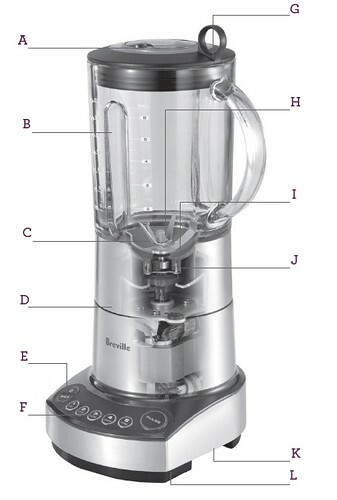 K Cord Storage - located beneath the blender so the cord is secured and out of the way. L. Sturdy non-skid feet - helps ensure that the blender is steady during operation.